Our interest is in study, research, protection, preservation, and enjoyment of the historic trails in Oregon and Washington. We have the privilege of living in the territory where overland emigrants settled and started new lives. Many of our members are descendants or know descendants of trail pioneers although many don’t have these connections. We strive to preserve our heritage. Some of the more notable NW sites along the trails are the Columbia River, Fort Vancouver, ruts near Echo, Barlow Road, Blue Mountains, Whitman Mission, the End of the Oregon Trail Interpretive Center in Oregon City, and the Oregon Trail Interpretive Center near Baker City. There is more to see on the Applegate Trail (the Southern Route to Oregon). Our chapter is deeply involved with researching, mapping, and marking the historic trails. We have semi-annual tours which are open to the public of sections of the trails. Please join us – it’s fun. The mission of the Northwest chapter of OCTA is to support and initiate local efforts using private and governmental partners and to join with adjacent chapters in support of the national association efforts in identifying, preserving, protecting and educating the public about the Oregon Trail and California Overland Trail legacy. 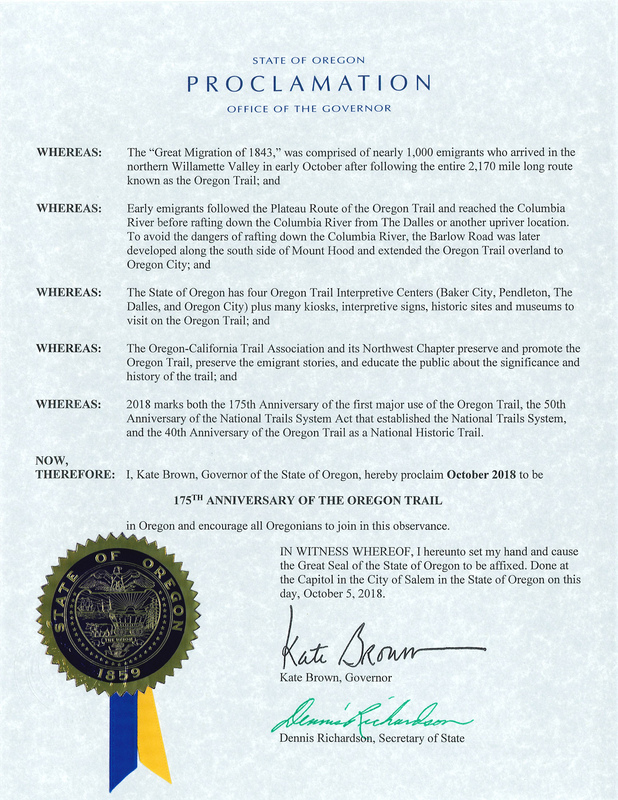 On October 5th Oregon Governor Kate Brown issued a state-wide proclamation honoring the 175th Anniversary of the Oregon Trail and marking the arrival of the Great Migration in October 1843. The year 2018 is also the 50th Anniversary of the National Trails System Act (1968) and the 40th Anniversary of the Oregon National Historic Trail (1978). Now more than ever the Oregon Trail in Oregon needs protection and its legacy shared with this and future generations. Note: The annual meeting was moved from March 23 to June 3, due to the late winter weather. Friday April 12, This Road We Traveled. Presentation and Book-Signing by Jane Kirkpatrick & Stafford Hazelett, with Art Show, Sandy, OR. 4 – 8 pm Sandy Library and AntFarm Cafe. See the attached document for details. Thursday, May 23, Chapter Mapping Committee Meeting. 10 am – 4 pm. Portland Area. The meeting is open to all with an interest in trail mapping. We will conduct some basic training using Terrain Navigator Pro (TNP) mapping software and plan future chapter mapping projects. We need help with trail research, much of which is done from digital sources, GPS data collection, and use of mapping software like TNP. If you have a serious interest in mapping, please plan to attend even if you feel your skills are somewhat limited. Training is available. The exact location will be determined when we have an estimate of the number that might attend. Please RSVP to Dave Welch at welchdj@comcast.net. Saturday June 1, NW Chapter 2019 Annual Meeting. Stevenson Washington. 9 am to approximately 3 pm. See the attached document for details. Shortly after Ezra Meeker completed his ambitious 1906 expedition to preserve the Old Oregon Trail the Daughters of the American Revolution approved a proposal to honor the memory of Oregon Trail pioneers in Washington State. The Sons of the American Revolution give support to DAR’s program. The Naches Trail crosses the Cascade Range through Naches Pass, roughly from today’s Bonney Lake in the west to Yakima in the east. Later the name was applied to the route from Walla Walla to Steilacoom, as an extension of the Oregon Trail. Below is a list of OCTA Northwest members holding elected and appointed positions with the chapter. Additional information is available in the link below. Northwest Trails is the newsletter for the Northwest Chapter. It is published quarterly (January, April, July, October) in electronic and print versions. The handbook provides by-laws other governing information for the chapter. Since 2000, the National Historic Oregon Trail Interpretive Center has honored individuals that have made significant contributions to trail history.